Mote and FWC have jointly collected 608 water samples through 14 days of routine coastal surveys between Tampa Bay and San Carlos Bay, Florida. 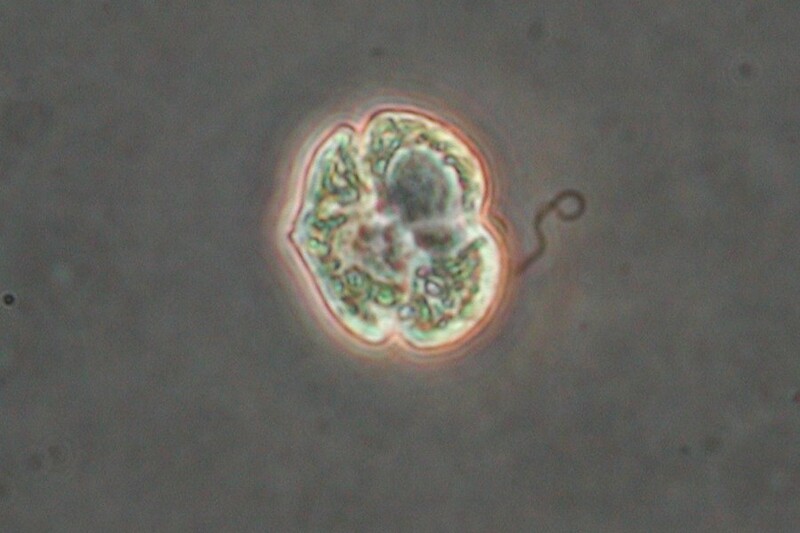 The researchers derived counts of Florida red tide algae cells and data on salinity, temperature and depth from all samples, and analyzed 228 for nutrients, toxins and the community of various other microscopic algae called phytoplankton, which have the potential to influence Florida red tide algae. Mote completed 640 red tide cell counts using beach water samples from Sarasota County, Florida. Samples were collected by the Florida Department of Health in Sarasota County, through their Healthy Beaches program, and analyzed by Mote to support statewide red tide monitoring coordinated by FWC. Mote has completed 400 cell counts to monitor Florida red tide in Sarasota Bay and 200 additional cell counts from waters off its New Pass dock and Bay dock on City Island, Sarasota. Since late November 2017, Mote’s Beach Conditions Reporting System (visitbeaches.org) has reported respiratory irritation, dead fish, or both (potential impacts of Florida red tide) 108 times in Collier County, 261 times in Lee County and 309 times in Sarasota County, and provided even greater numbers of reports with NO red tide impacts on multiple Gulf Coast beaches, helping beachgoers choose where to visit on a given day. Mote’s state-funded, Cooperative Red Tide Research and Mitigation Program with FWC’s Fish and Wildlife Research Institute is dedicated to protecting public and environmental health. This is accomplished through extensive partnership efforts in monitoring, public information and education. The Cooperative Program also provides base support for Mote and FWC to apply the resources of federal agencies and universities to identify, track and model red tide bloom movements for developing predictive models. These collaborations also provide resources for Mote to respond to red tide-affected marine life that are treated at Mote’s hospitals for sea turtles, dolphins and small whales. Beyond vital monitoring services that provide public information and help us understand the environmental factors associated with red tide, Mote scientists are studying control and mitigation methods that may benefit limited-tidal-exchange waterways, such as dead-end canals and small embayments in red tide-affected coastal communities. Past studies have helped to rule out control and mitigation methods that may be ineffective or more harmful for our waters, including clay flocculation and aerial application of herbicides. Ozonation (a patented process we already use to remove red tide in the water entering our public Mote Aquarium and the marine mammal and sea turtle hospitals) to be used to destroy red tide algae and their toxins in limited areas of water such as canals and small embayments. 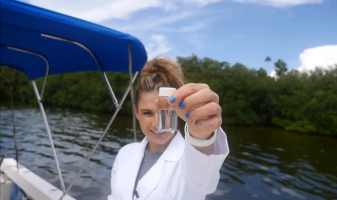 This research is advancing thanks to the Boca Grande Initiative, a matching challenge begun in 2017 when anonymous supporters donated $100,000 to help Mote scientists expand their red tide-related research and outreach efforts in Boca Grande and asked the community to match their contribution. Since then, the community has rallied to provide a full match for the support, and funds from the initiative are already being put to work. For a start, the funds are driving forward our ozonation research, with field tests in Boca Grande in the near future. “Living dock” structures covered with filter-feeding animals that remove red tide from limited areas of water such as canals and small embayments. Concentrating naturally produced compounds from certain macro-algae (seaweeds) to be used to fight red tide blooms in the wild, considering that we know that these compounds can kill red tide in the lab. 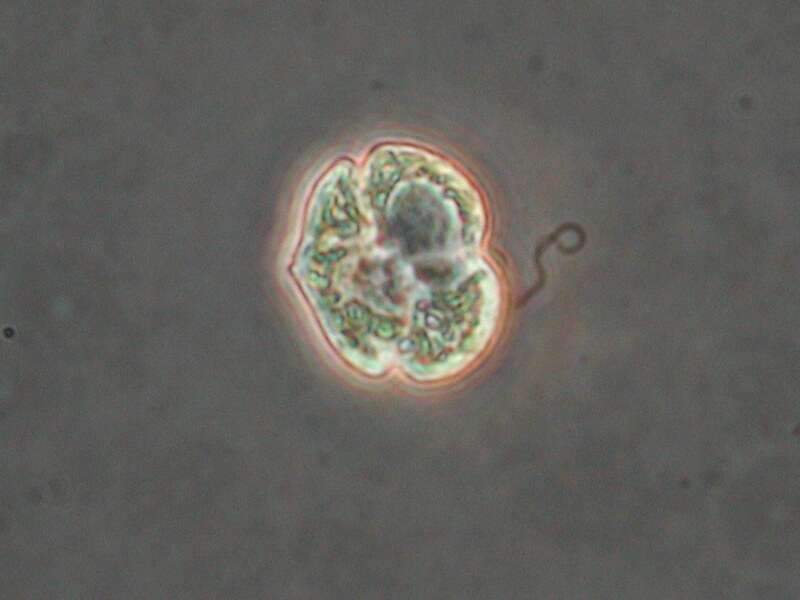 Use of algae in the Amoebophrya genus (the same broader group as Karenia, the dinoflagellates) to serve as a natural control parasite for K. brevis red tide blooms. In addition to our research efforts, Mote’s Stranding Investigations Program is actively involved in the rescue and recovery of marine life vulnerable to red tide. The Program has rescued or recovered 131 sea turtles since the start of 2018. A sizeable proportion of them had observable signs of human interaction, such as boat-strike injuries or fishing gear entanglements/ingestion. However, another notable portion are believed to have been affected by Florida red tide because they were rescued or recovered from red-tide areas without other obvious signs of injury or illness. To better assess whether they were exposed to red tide, Mote staff have collected biological samples when possible and will submit them for analysis, which will take time. Mote is developing a new, improved version of its red tide detection instrument originally created more than a decade ago. The new Programmable Hyperspectral Seawater Scanner (PHYSS) detects red tide in seawater with higher resolution than ever before. Mote research is currently developing hand-held sensors for local shellfish growers to use to inform state and federal health agencies whether their cultivation waters and/or shellfish product contain red tide toxins. This would help to lessen the negative economic impact to these growers if there is red tide in the general vicinity but no toxin in their shellfish. Mote scientists are exploring how to advance aerial monitoring of red tides using drones carrying hyperspectral cameras, for finer-scale data collection than satellite images can provide. Unlike satellites, drones will be less impeded by cloud cover. Mote scientists are also advancing knowledge of red tide impacts in protected marine wildlife: manatees and sea turtles. Can more be done? Absolutely! It is critical that Gulf Coast communities, organizations and government agencies at the local to national level continue and enhance their support to enable much-needed advances in red tide research, monitoring, control and mitigation. Our vision for the future: To further benefit Gulf Coast communities and ecosystems, Mote and its partners envision the future creation of an independent Florida-based Marine and Freshwater HAB Center that will utilize innovative approaches and technologies to address Florida red tide and other HABs through: rapid assessment and modeling for HAB forecasting; HAB prevention, control and mitigation of impacts; public health protection; and expansion of local community outreach and engagement. Learning from fish kills: During the 2017-2018 red tide in particular, many community members have reported fish kills, including large spawning individuals of a treasured sport fish species, the common snook. At this time we don’t fully understand the impact to snook populations; with additional funding support for fisheries research, Mote scientists and partners would have the opportunity to adapt population modeling to improve our understanding of how snook populations are faring. While the latest significant red tide fish kills have been reported south of Mote’s current areas of permitted fisheries enhancement research, the reports of large-scale fish kills evince the need to support the use of responsible fish stock enhancement to help sustain valuable fisheries, such as the common snook fishery, as they move into an uncertain future. Mote is a multi-decade leader in fisheries-enhancement technology and method development, focusing strongly on common snook, and we are ready to initiative such a stock enhancement effort if the State desires to move in this direction. This spring, through the leadership of Congressman Vern Buchanan, and with bipartisan support, an appropriation of $8 million was designated for the federal agency NOAA’s National Ocean Service to fight red tide impacts. The congressman turned to Mote recently for independent, objective expertise and science-based information as he championed the bipartisan effort for this critical appropriation that should help the U.S. government take its rightful place in support of much-needed, improved red tide research and mitigation efforts at state and local levels. Mote scientists look forward to the opportunity of working with partners to leverage and make most efficient use of any federal funding that may become available for greatest impact in the fight against Florida red tide. To report fish kills, contact the FWC Fish Kill Hotline at 800-636-0511 or submit a report online.